Aditi is one of the leading and most advanced cloud based visitor entrance & tracking management software is developed with the latest Technology blend involving HTML 5.0, ASP.Net 2015, C#, Angular JS and Ajax. Aditi can be instantly activated on a Cloud and is available on both Private Cloud, SaaS Model (with economical investment) and installed in your Premises. Aditi - Supports validating & printing badges for visitors on arrival at the Front-Desk, Kiosk based registration of visitors and Pre-Appointment Visitors. You can design your own Badge Template and within a click the same can be printed with barcode. It sends meeting invites, prints visitor passes and notifies the host when the guest arrive. It allows organizations to automatically track visitors and employees for enhanced security and safety whilst being administered from one centralized location. Aditi has facility to scan the photo ID or business card of an arriving visitor then instantly check whether the visitor is expected or has been in the facility before and make sure the visitor is not on a watch list. In additional, you can turn-on the optional OTP (One Time Password on Text /SMS) to authenticate the visitor over his mobile. These quick and consistent checks ensure that only the right people are allowed on site. After scanning the information, the Visitor Management System will take a digital photo or capture the visitor's signature. The Visitor Management System will then automatically contact the visitors host by e-mail or with a real time network messaging to announce the visit. Alternatively, the visitor can register himself/herself on the Kiosk. Once it is approved by the Host, they will be getting the message on mobile. Then the Front-desk or the KIOSK can print the badge for the visitor. Visitors can also register using the website for a pre-authorized entry. On approved by the host, visitor will be getting the Visit Passover Email as PDF Attachment with a barcode, which the visitor can show in the Front-Desk or Gate to secure entry. Once the visitor is registered, an individualized badge will be generated. Specific visit restrictions may be set, such as clearance level, access area or visit expiry time. At the end of the visit, the system will sign out the visitor with the barcode. If the visitor does not sign out, the system throws the alert and notifies the host who in turn either can extend the visitor stay or can intimate his exit. This simple yet powerful visitor registration process forms the basis of a very powerful security platform. Registering all visitors through the Visitor Management System ensures that the client will have a centralized and complete record of the visitor traffic, strengthen visitor security, improve productivity and service to the customers. The solution can stand alone or integrate with existing business systems and access control systems. This reduces duplicate or redundant information and the likelihood of human error for example, granting of access to banned persons. 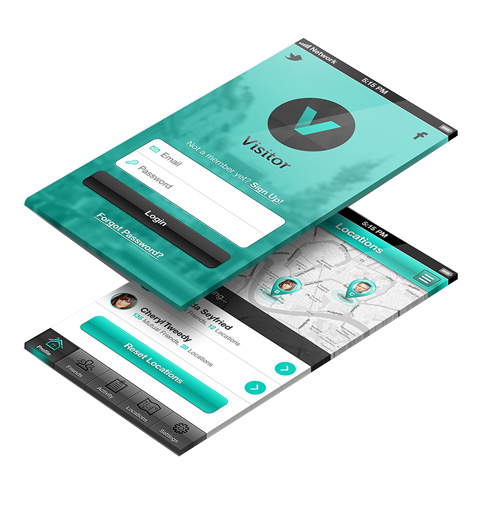 Looking for Visitor Management app?